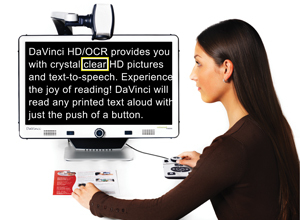 DaVinci is a high performance desktop video magnifier (CCTV), featuring Full HD, text-to-speech (OCR) and a 3-in-1 camera. 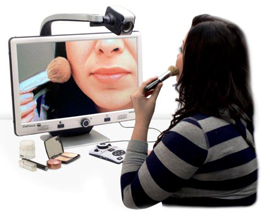 With Full HD you will experience high definition color and contrast giving you a beautiful, crystal clear picture and vibrant colors. Experience the joy of reading with our new text-to-speech feature. DaVinci will read any printed text aloud with the push of a button. See near, far and everything in between. 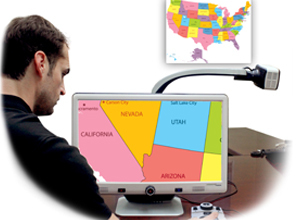 Easily pivot DaVinci’s screen to provide a comfortable viewing position. DaVinci Sony® Full HD camera displays crystal clear images in vibrant color and contrast, resulting in the brightest white and deepest black. 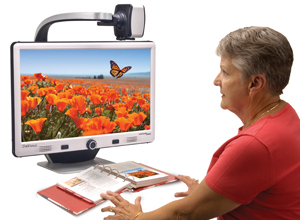 DaVinci’s high resolution LCD produces maximum levels of picture detail for a clear, bold display. Large field of view allows you to see more on the screen. First Name: A value is required. Last Name: A value is required. State: Select a State AL – Alabama AK – Alaska AZ – Arizona AR – Arkansas CA – California CO – Colorado CT – Connecticut DE – Delaware DC – District of Columbia FL – Florida GA – Georgia HI – Hawaii ID – Idaho IL – Illinois IN – Indiana IA – Iowa KS – Kansas KY – Kentucky LA – Louisiana ME – Maine MD – Maryland MA – Massachusetts MI – Michigan MN – Minnesota MS – Mississippi MO – Missouri MT – Montana NE – Nebraska NV – Nevada NH – New Hampshire NJ – New Jersey NM – New Mexico NY – New York NC – North Carolina ND – North Dakota OH – Ohio OK – Oklahoma OR – Oregon PA – Pennsylvania RI – Rhode Island SC – South Carolina SD – South Dakota TN – Tennessee TX – Texas UT – Utah VT – Vermont VA – Virginia WA – Washington WV – West Virginia WI – Wisconsin WY – Wyoming Select your STATE Phone Number: A value is required. Email: A value is required.Invalid format. Please mail me a copy.